I've been planning to write about this hut since this site was started. Although with some delay, finally the time has come to realize this plan. 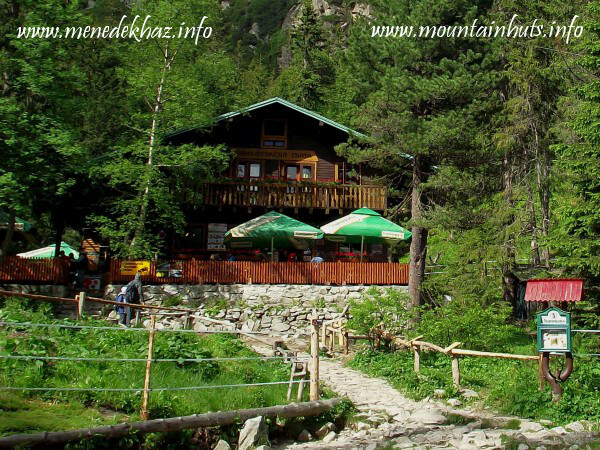 The Zamkovszky Hut will likely be familiar to many, as it is located by a very popular hiking route and only few people can refrain themselves from taking a short break here. For years, I was also just a dine-in guest of this house, then later some trips turned out to be best organized if we stayed here overnight. So the experience became complete, but it did not change my opinion in any way: skipping this hut is a mistake! Though the house itself is relatively young, its history is quite eventful. In fact, the Hungarian Carpathian Association planned to build a shelter in the Malá Studená dolina already back in 1897, but this idea, contrary to their other projects, was not realized back then. Forty-five years later, a renowned mountaineer, István Zamkovszky (1907-1961, with Slovak spelling: Štefan Zamkovský) decided to build a new accommodation facility by the trail that leads to the Téry Hut (which he was the manager of at the time). Thoughts were followed by fast action, and by 1943 a new house stood on the lovely forest glade surrounded by high pinewoods, in the close vicinity of the Magistrála, the famous "Upper Traverse Trail" of the Tatras. 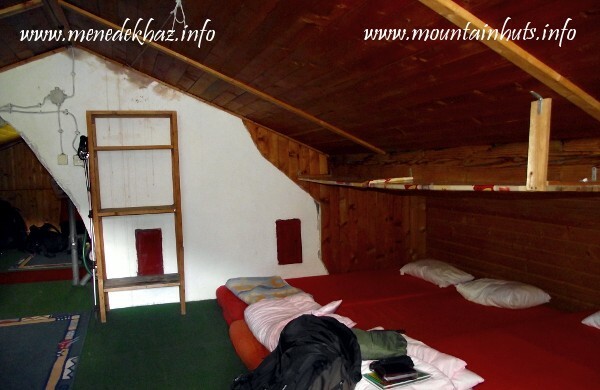 It soon became very popular among the hikers and climbers, who started to call the hut after its builder. However, Zamkovszky and his family could not enjoy the fruit of their work for long, as the Czechoslovak state nationalized the hut in 1948. Two years later, for political reasons, the family was expelled from the Tatras’ territory, and in 1951 the house was also renamed to "Captain Nálepka Hut". However, the attempt to erase the original name proved to be unsuccessful, as the people continued to call the hut by the name "Zamka". After the political changes and the formation of the Slovak Republic, the Tatra huts were privatized and the Zamka got back its original name. For a short time, its ownership was shared between the Slovak Tourist Club (KST), the mountaineering association JAMES and the Slovak Ski Association. 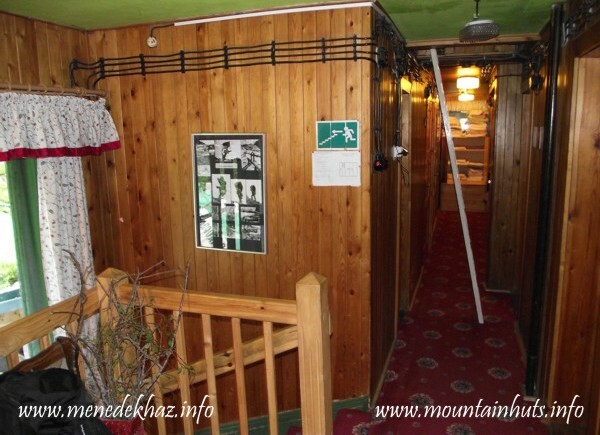 In 1992 the descendants of Zamkovszky succeeded to regain their heritage and leased the hut. From 1996 to this day, it is managed superbly by Jana Kalinčíková, who started this demanding job at the age of 26 (not without experience though, as she worked in the nearby Zbojnícka Hut beforehand). 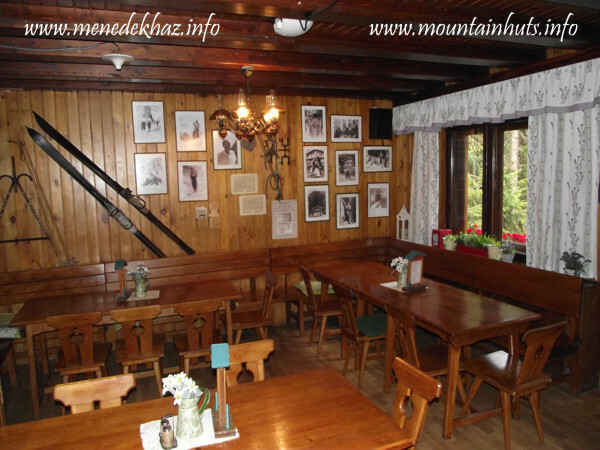 Now, let’s talk about what is probably the biggest attraction of the Zamkovszky Hut: the delicious food. It would be useless to give a full listing of the available foods (for that, just take a look above the kitchen booth, each dish is accompanied by a photo to avoid any misunderstanding), but I would highlight some personal favorites from the wide offer. Such is their tasty garlic soup (cesnaková polievka) or their yummy steamed dumplings filled with chocolate and jam (buchty na pare or parené buchty), of which I haven’t eaten better elsewhere yet. Neither was I turned down by their bryndzové halúšky (potato dumplings with sheep cheese and bacon, a Slovak national dish). 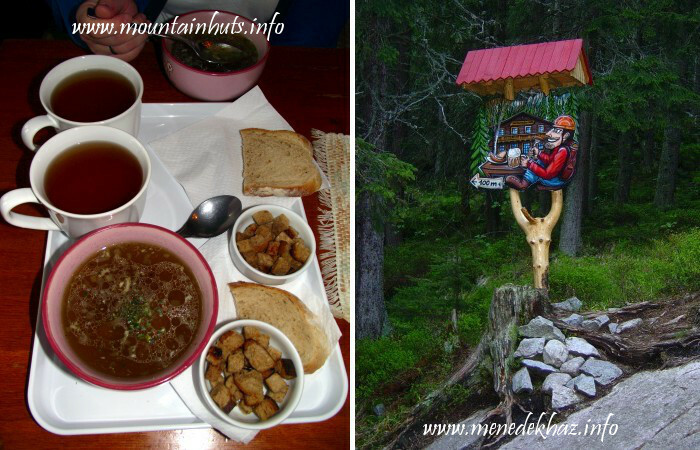 Of the drinks I have to mention the special "sherpa tea" (bylinkový nosičský čaj) made of selected herbs, which is offered by most High Tatra huts, but has a different – and of course top secret – recipe from one place to the other. Speaking of tea, it is worth to know that if you would like to prepare your own before the morning start, it is possible to ask hot water (teplá voda) in your flask, similarly to other huts. Accommodation prices depend on the time of the year and the length of your stay. In the high season (from the beginning of June till the end of October) the first night is 18 €, while further nights cost 16 € each. In the low season the price is uniformly 15 € (all figures are given per person). The members of various climbing and hiking organizations can benefit from different discounts. Probably most of us are interested in the category of Alpenverein and other non-Czech or Slovak associations, which means a reduction of 2 € from the above mentioned rates. If the rooms are full and we can only get a place in the attic, we can count on a further discount. Apart from the basic fee, we will have to pay touristic tax (1 € per day per person), and the one-time fee of bed linen cleaning (1 €). The latter can be eliminated if we bring our own sleeping bag. In addition to accommodation, half-board can be arranged for 11 € per person per day, or one may also opt for only breakfast (4.5 €), dinner (6.5 €) or lunch (5 €) instead. Such choices will somewhat restrict our program for the day, as the kitchen opens at 7:30 in the morning and closes at 20:00 in the evening (the latter is usually not followed by instant tranquility, but from 10 pm there is official "quiet hours", which is kept strictly). Of course, you can also eat a’ la carte whatever is on offer between these times. The area around the Zamkovszky Hut offers various hiking possibilities; there are a couple of marked trails that can be combined in a number of ways. 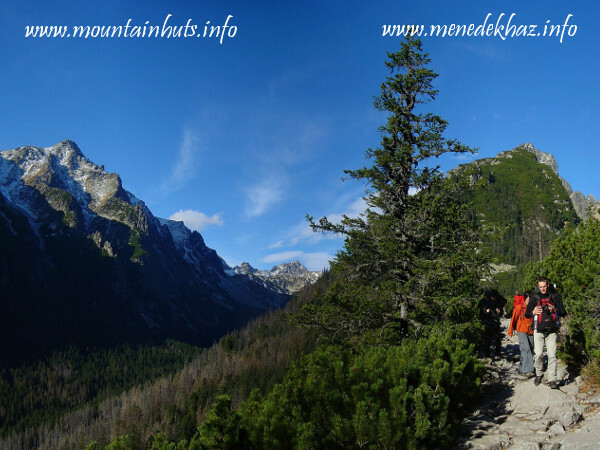 Now, instead of attempting to write a complete guidebook, I would only highlight one round-trip option that lets you explore the two neighbouring valleys of Malá Studená dolina and Veľká Studená dolina, incorporating one of the most challenging hiking routes in the High Tatras, which links these valleys via the high pass of Priečne sedlo. 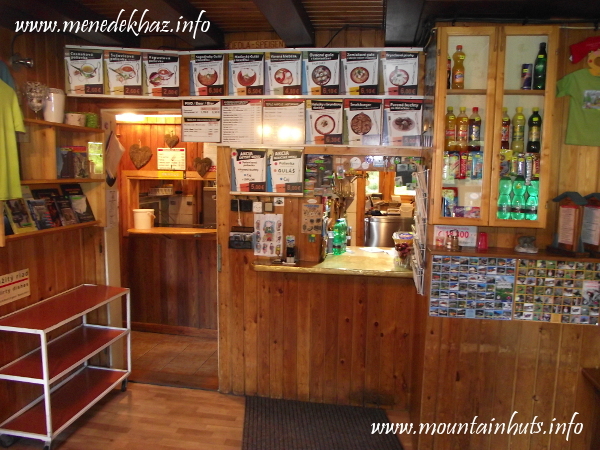 In addition, you can also check out no less than four mountain huts along the way… :-) Start your journey from the Zamka towards the Téry Hut, following the green marks. From here, change over to the yellow marks, which accompanies the green for roughly about 1 km, but then branches off to the left, guiding you towards the Priečne sedlo. The upcoming climb will include some airy sections that are secured by chains, but still need attention, especially when there are many people on the trail (which often happens) or when the rock is icy (not a rare thing, either). After the pass, a steep but less demanding descent follows to the Zbojnícka Hut. Proceed on the blue marks, which will take you down the valley of Veľká Studená dolina, from where you can get back to the Zamkovszky Hut as if you approached it from Hrebienok (described above). With an early start, in favorable weather conditions, this route can be done within a single day. You will have to cover a total of ±1070 m elevation to complete the circle, including getting through some exposed places, so good physical and psychical state is necessary for this hike. Keep in mind that the route between the Téry and the Zbojnícka huts is closed during the winter season. Summary: Owing to its relatively low location, the "Zamka" is one of the most easily accessible huts in the High Tatras, which is clearly reflected by its great popularity. The delicacies served at this genuine "gastro-hut" are worth a visit on their own, but nonetheless the area is rich in spectacular natural sights and interesting hiking routes as well, most of which are open to the public even during the winter season. Add a friendly staff to that, and all is said.